This is the furnace setup, somewhat disassembled. The blower and VFD (Variable Frequency Drive) power supply live on a small welded box-tube steel frame. The air/fuel delivery pipe are inserted into the furnace and pressed up against the flange on the blower. 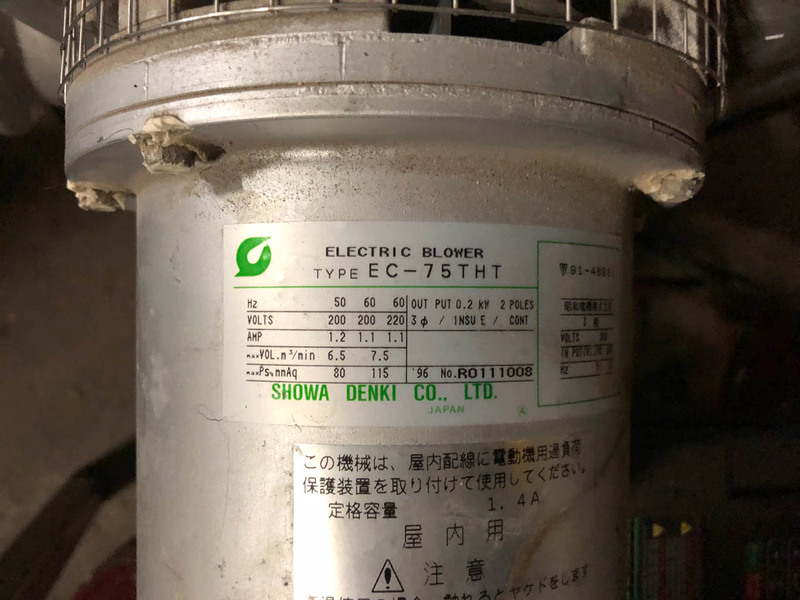 The blower motor is a 3 phase motor and the speed of the motor and thus the air delivered can be varied by varying the frequency of the 3-phase power supplied to it by the VFD. The motor is designed for 60 Hertz and so 60 Hertz could be thought of as 100% of the rated speed. 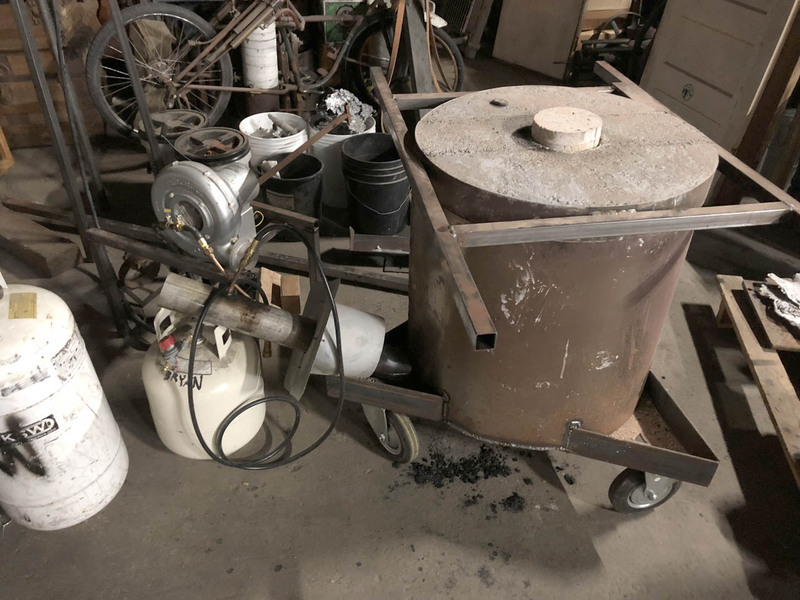 We took the motor up to about 20-25 Hz in testing, but it was way too much air- it was blowing the fireclay/sand mixture out of the base and blowing the bits of wood we had burning (for lighting the furnace) right out the exhaust port pre-heater on the side. 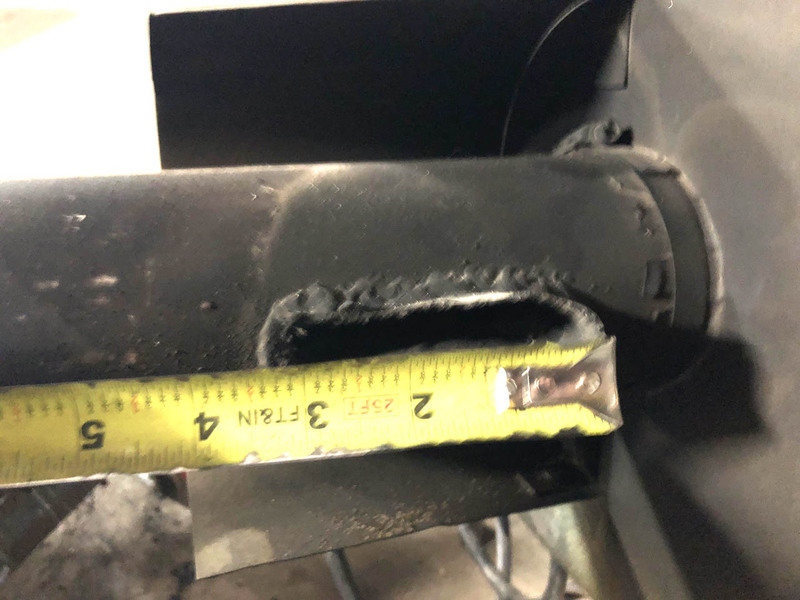 We found that 17-18 Hz was a good speed to run it at where it got enough air, but not so much excess to blow the flame out or add too much cooling air to the furnace. The furnace is adapted from Colin Peck's book "The Artful Bodger's Iron Casting Waste Oil Furnace"- scaled up a bit- more on this later. The frame is 3 inch angle iron welded up with standard 450 pound casters from Harbor Freight (1 swivel "smart" caster in front and two fixed "dumb" casters in the back"). 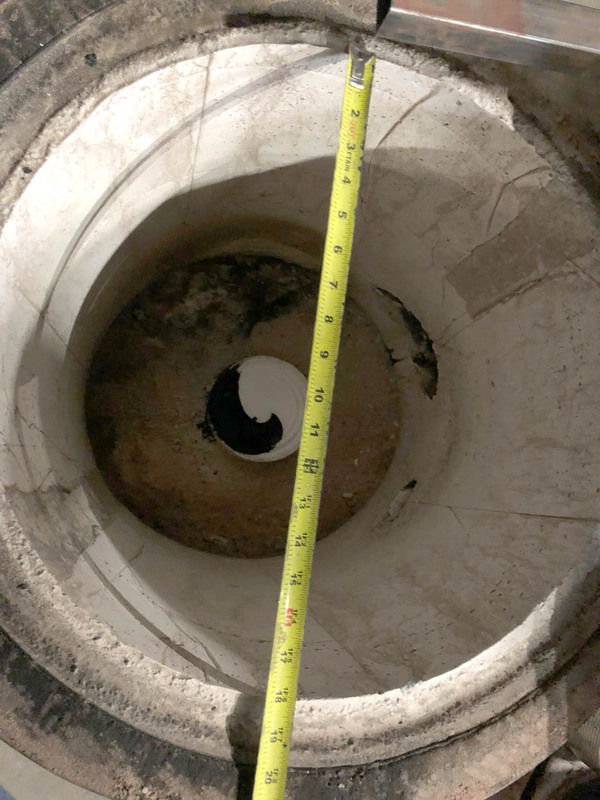 It's an 18 inch Inside Diameter (or bore) with 2 inches of 3000 degrees Fahrenheit rated (1649 degrees Celcius) Mizzou castable refractory (held in place by an 18 inch sonotube during "pouring") and 2 inches of vermiculite insulation, per Colin's design. Here's looking down in the top after a couple test fires. 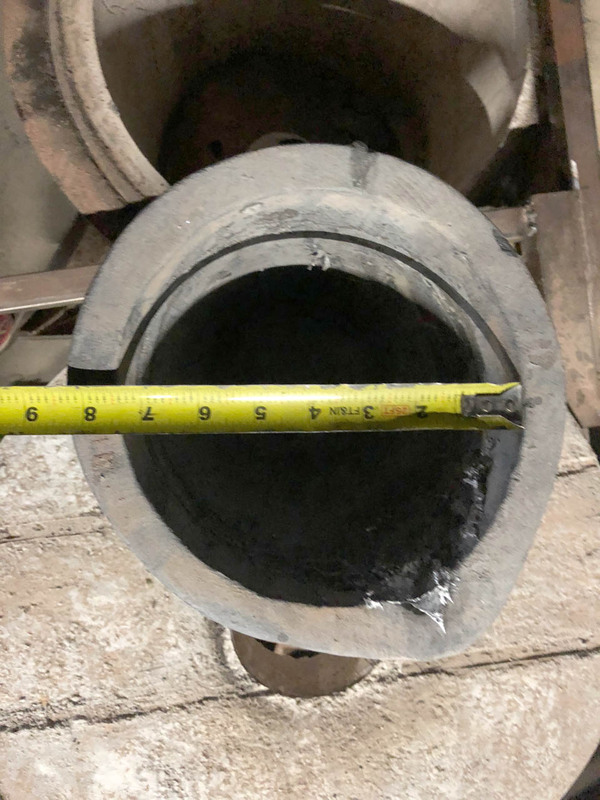 You can see the air inlet tube and the exhaust pre-heater outlet as well as the 6 inch diameter, 3 inch high plinth that we made from leftover refractory from the main furnace. The leftover carbon on the plinth is what was under the crucible when we lifted it off and is what didn't get washed away by the flames. 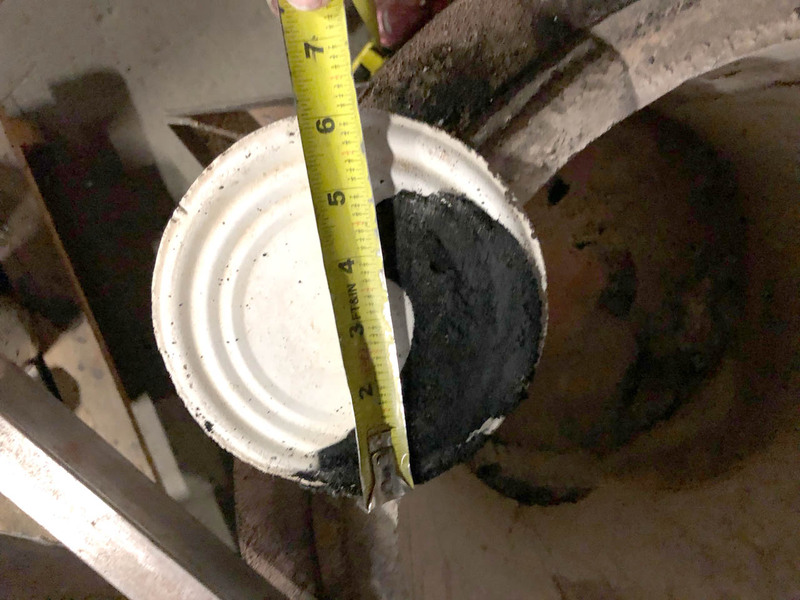 The bottom of the furnace is a couple inches of 50% fireclay (from Clay Planet in San Jose) and 50% silica sand (60 mesh, I believe). The flame/air was so powerful in some of our testing that it actually eroded some of the sand/fireclay base away and just blew it everywhere. It probably wasn't wet enough when we packed it so it didn't adhere to itself very well. The top of the insulation shell was also topped with the same mixture and it was adequately mixed and has held up remarkably well. Here's the inside height of the furnace. 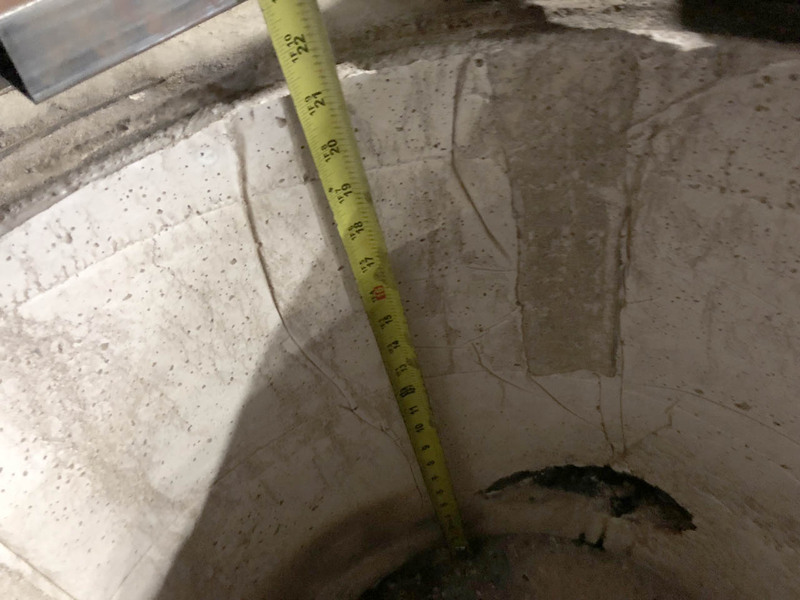 21" (inches) or 53.3 centimeters, from the top edge down to the top of the rammed up bottom, so it's an effective internal height. Here is a view of the cross section of the furnace wall. 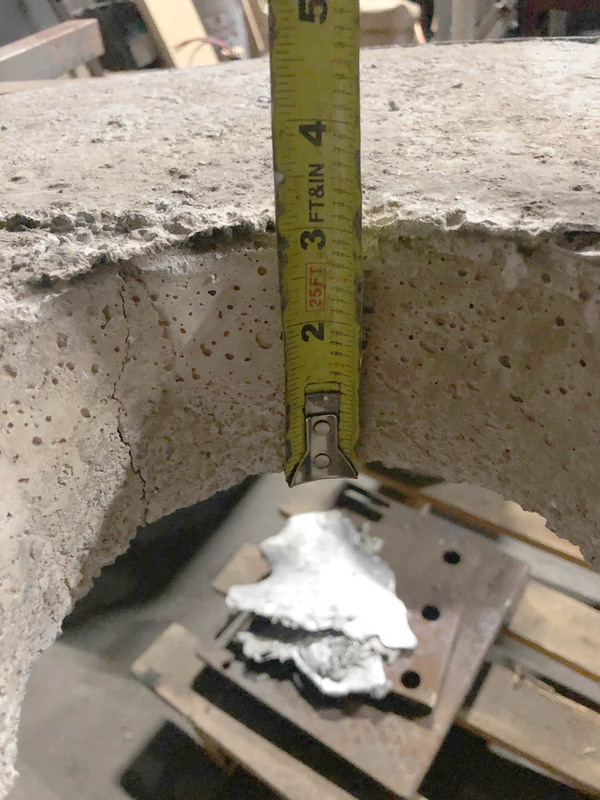 The inner two inches are cast Mizzou castable refractory (held in place by an 18" thich-walled cardboard sonotube, which are used normally for holding concrete INSIDE them for making concrete columns in construction. 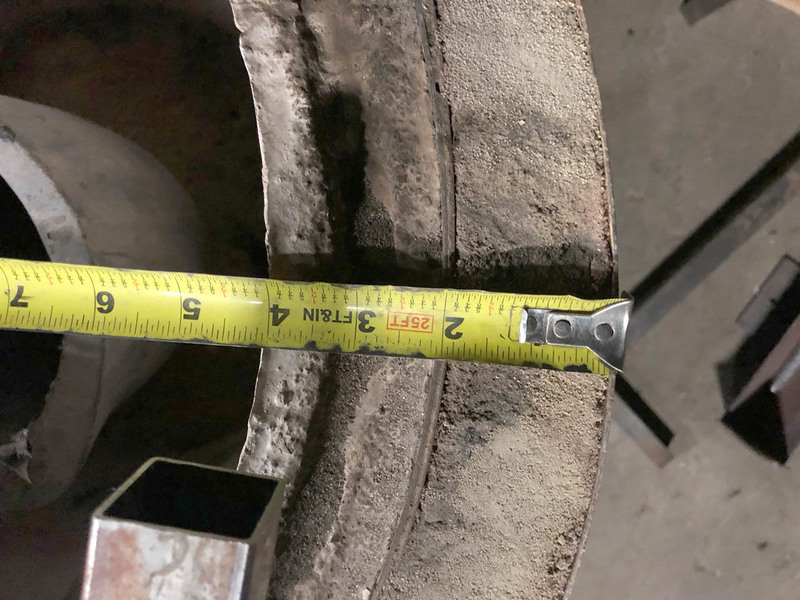 This was contained by a 22 inch diameter sheet metal sheel that we rolled from roughly 10 gauge sheet metal and welded the seam. we cut 2 inch blocks out of wood to use as spacers while we were ramming it and pulled them up and out as we went. The sonotube was covered by a plastic trash bag to keep the refractory from losing moisture to the cardboard, so we didn't have to use any oil or form release compound. 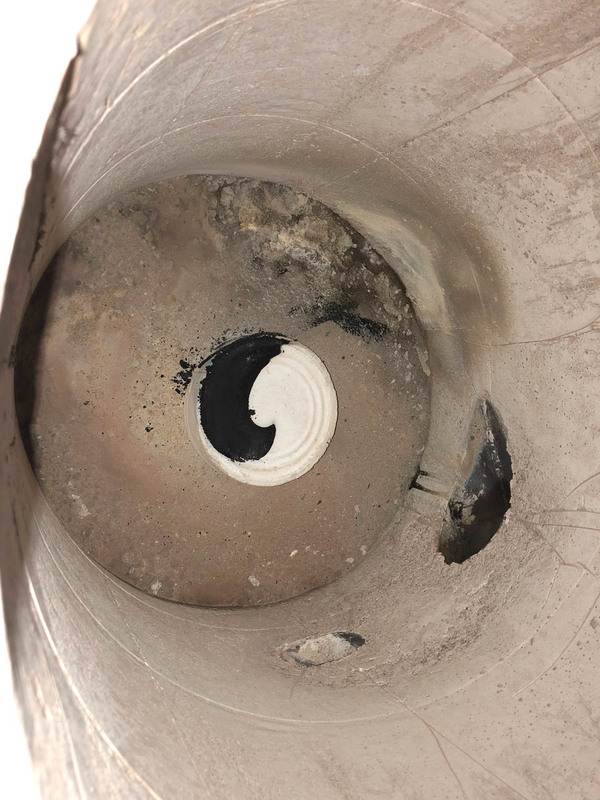 This lent some interesting textures to the inner bore in the refractory once it set and you can also see the spiral pattern in the sonotube as well, but this does not affect performace at all nor does it induce or promote cracking at all. The outer layer is loose Vermiculite. A large bag (2 cubic feet) of vermiculite at Home Depot is about $22 and we rammed up pretty much an entire bag. Per Colin, another, sometimes used garden soil ammendment, Perlite, is not up to the task for cast iron temperatures. The top was sealed with the same mixture we used in the base, only this time, we got the mixture wet enough, it actually pefrormed like it should have. 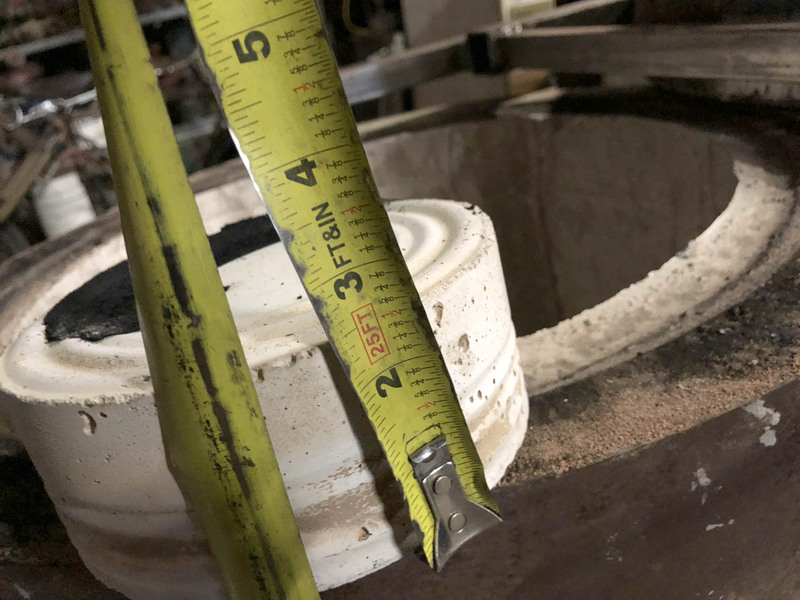 Lastly, the refractory has a small half-circle groove cut into it (while wet) for the inclusion of a length of woodstove/fireplace gasket rope to seal the surface between the top of the furnace and the underside of the lid. We haven't messed with that yet. 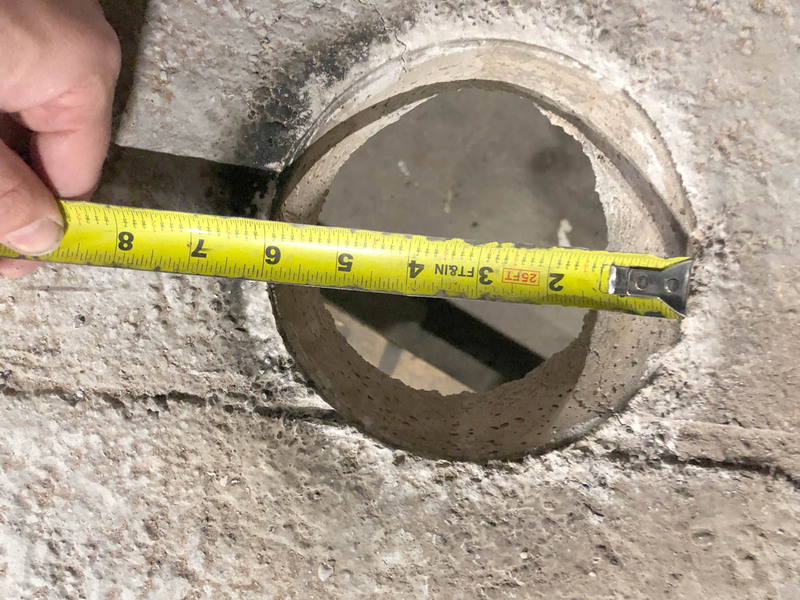 This is where the air/fuel delivery tube enter the furnace and where the exhaust preheater come out (get Colin's excellent book if you want to know more about that) We had to do some creative clamping to hold the refractory from falling out while it was still "wet" and curing. Please disregard the ugliness of the welds- they were made in a hurry by some of our less experienced (at welding) staff members, but they all hold just fine. Here's a side view of the air/fuel delivery pipe. This is mostly to show the preheater inlet port and the relative necking down of the tip to increase the air velocity to help with atomization of the oil. Also seen is the VFD mounted next to the motor- Not sure why that old pouring shank is leaning against the whole thing in the picture, but whatever. I added a ball valve just upstream of the needle valve so that if we ever got the needle valve perfectly adjusted and wanted to shut the flow of oil off quickly and without disturbing the needle valve setting, we could. Also, there is a quick shutoff ball valve (90 degrees between full off and full on) at the bottom of the elevated fuel tank, which was a used, though still pretty new, 125 psi air tank from Harbor Freight. The nice thing about that was that since it was designed to hold pressure, we could pressurize the fuel supply if we wanted to without worry and it even had a pressure gauge built onto it already. 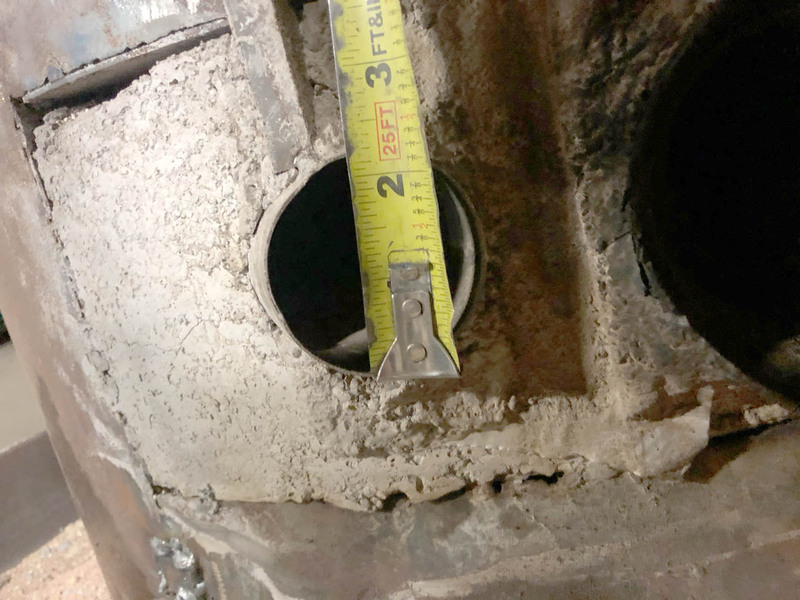 Here is the air/fuel inlet into the furnace. Both pipes are staineless steel from the scrap yard (SIMS in San Jose) I'm ashamed to admit, but after very carefully using Colin's parallel line development method for creating the perfect curve to match the furnace shape where it came in, I had to hack it into quarters lengthwise and expand it (space it out) and re-weld it to make the tube a larger diameter so that the exact same type of pipe could be inserted into it and still fit ok (loose, but snug- does that make sense? ), You can see the 4 welds going down this. This was tough as I was just using a plain mig welder with copper coated steel wire. Even at the lowest heat setting, I kept burning through the pipe so I had to do a series of spot welds down the entire length, which is why the welds look so rough in the tube. The point of this picture is to point out that the OD is right about 4 inches (10.1 centiimeters). 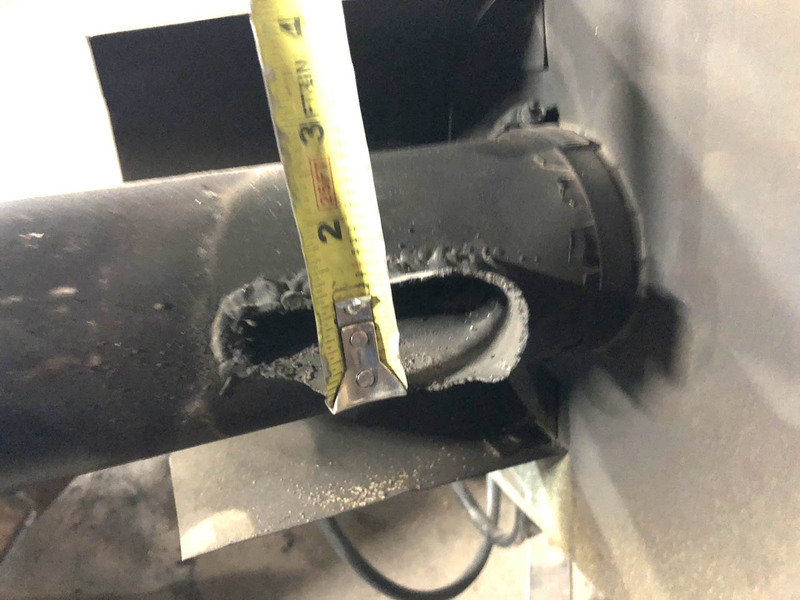 The ID is probably 3-7/8" (9.8 centimeters) and the wall thickness is probably ROUGHLY about 1/8" (or about 1.6mm) and the exhaust preheater pipe is about half that thickness- this was all from the scrapyard- not McMaster Carr. 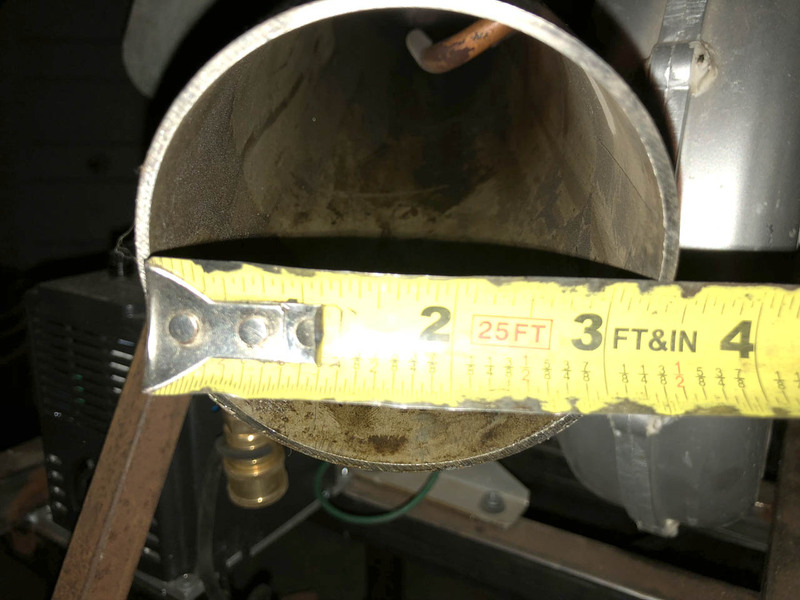 Here is looing down the air/fuel delivery pipe from the fan/blower end toward the furnace. The ID is about 3-1/4" (or about 8.3 cm) for about 8.3 square inches (53.5 cm^2) cross sectional area. You can see the propane inlet- it probably should have extended further down the tube. 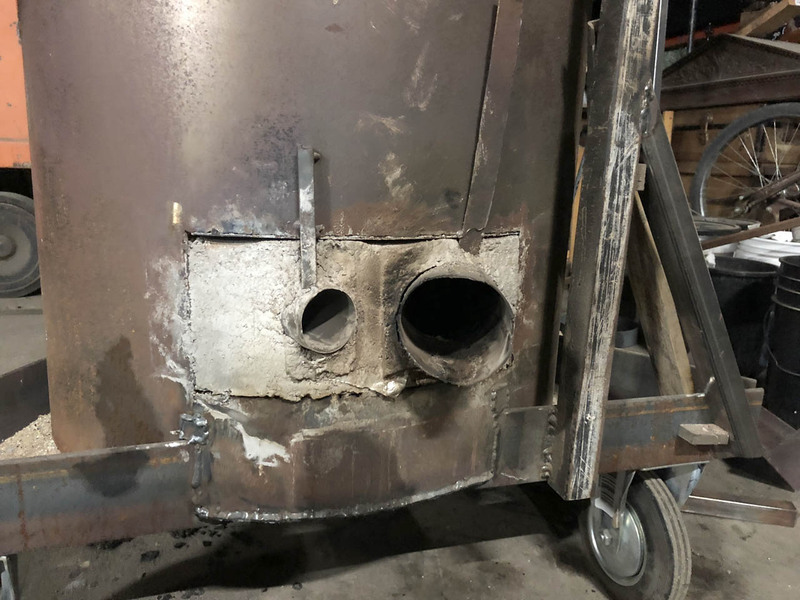 This does promote better mixing of the propane and air, but we also had the problem of the flame front occassionally recessing into the tube and burning before it entered the furnace. Here's the OD of the air/fuel pipe. It's 3.5 inches (or 8.9 cm), but who really cares? This dimension doesn't really affect much. 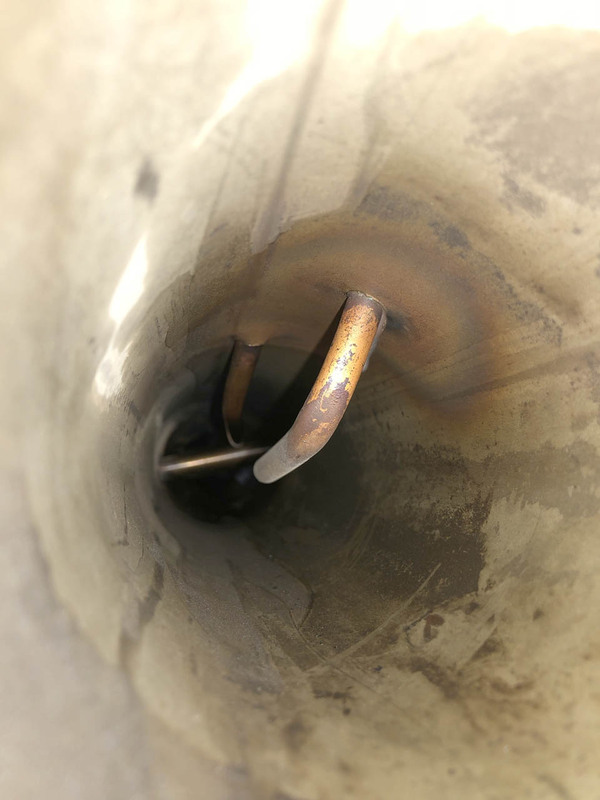 In order to increase the air velocity, the end of the air/fuel delivery pipe was slit, squeezed down and TIG welded by Sterling. The new ID is approximately (because where would you measure it from exactly, anyway?) 2-1/4 inches in diameter (5.7 cm) or 4 square inches (25.7 cm^2) cross sectional area. When we started experimenting with pressurizing the fuel tank and not just doing a gravity feed (because the fuel was just sort of dribbling out and being caught up in the airstream in a thin line), we also mashed the end of the fuel delivery pipe down with a pair of pliers to try and make a crude atomizing nozzle out of it. This only mildly worked as the result was the fuel stream being broken into two fuel streams- one at each corner of the pipe where the radius allowed a smal circle of fuel to escape while the rest of it was flattened close to itself. This was after trying to get it to work fully open. 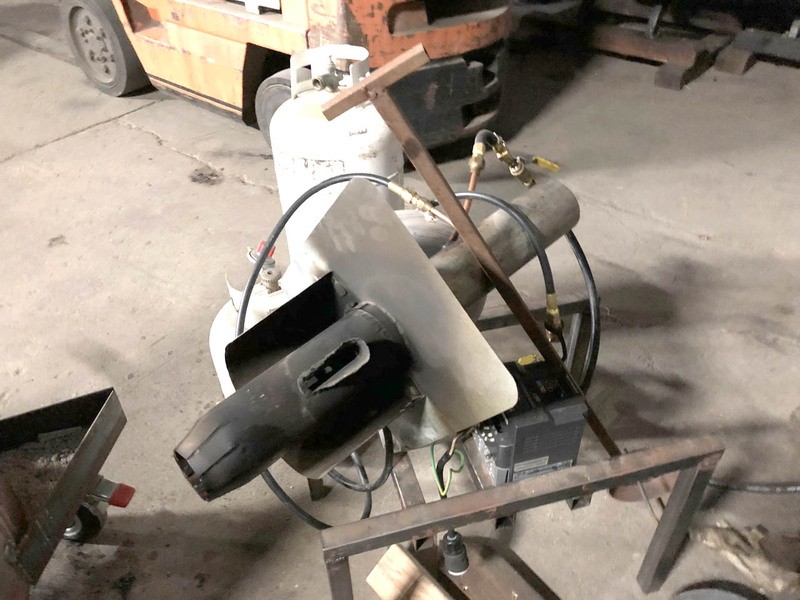 The problem didn't seem to be fuel delivery- the needle valve would open up enough and allow enough flow, particularly when we put 25 psi of air in the tank to push the fuel out. I tried to scale the same stepdown ratio as what Colin's design was in his book. Not sure if I got it right, or, for that matter, how crucial it is to be exact, either. 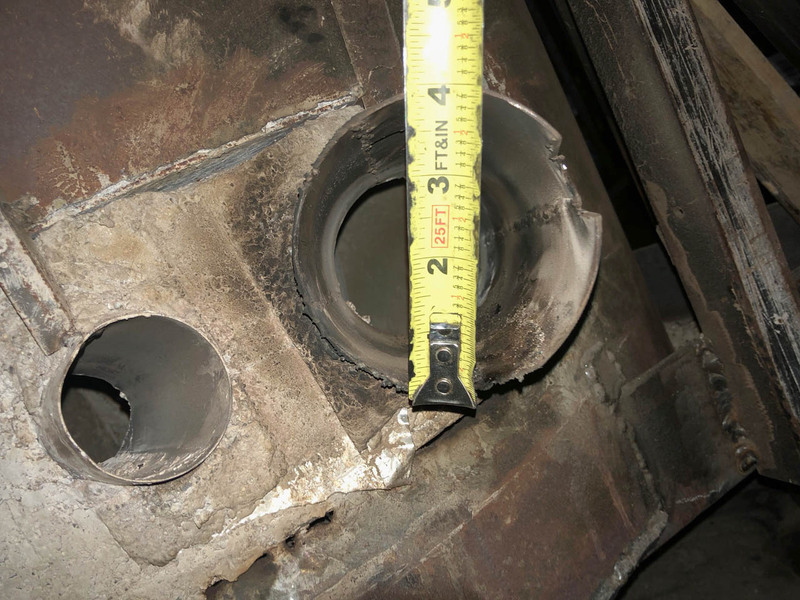 Here's another view looking down the air/fuel delivery pipe. 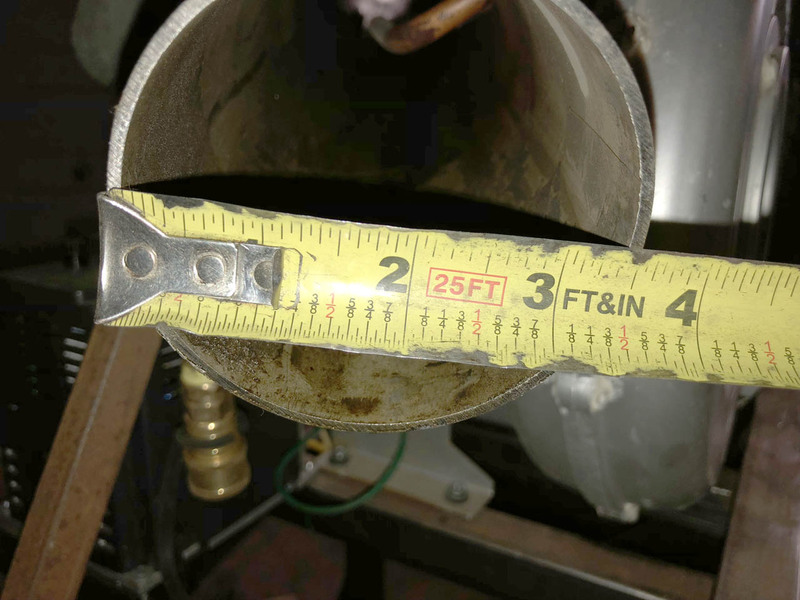 The copper tube closest to the camera is where the propane comes in and the one further down is where the WMO comes in. It curves down to just above the preheater cross pipe to pre-heat the oil. 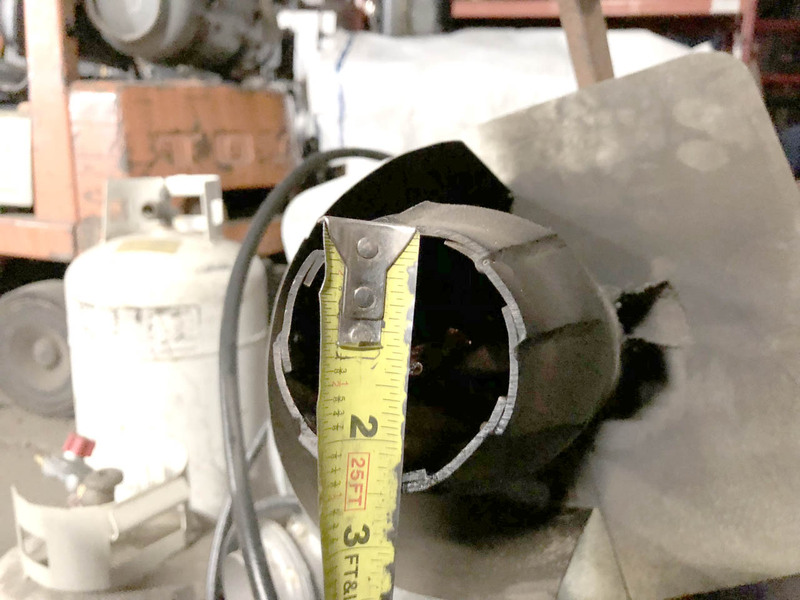 In our first trial, we didn't use enough air and the flame front receeded into this pipe, proceded to coke up whatever oil was in the oil pipe and totally melted/vaporized the last few inches of the oil delivery pipe. The whole exhaust flame turned a pretty blue/green for a bit while this was happening. I knew it was a "bad thing" as soon as I saw it, but I had no idea where the copper was coming from, until we shut it off and let everything cool down. With that much refractory, it takes a while to cool down. Here is the business end of the air/fuel delivery pipe. 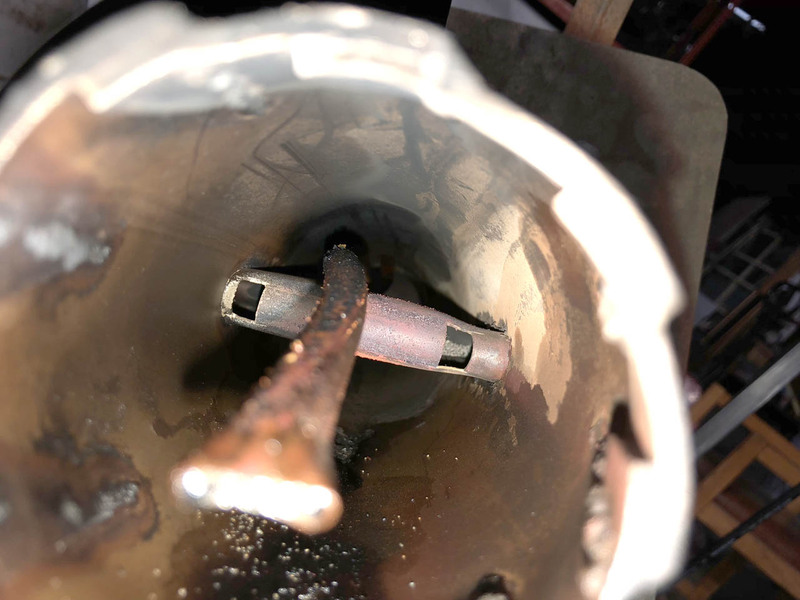 You can see the newly replaced and even more newly smashed fuel delivery line (blurred to destroy the evidence) and the preheater cross pipe. 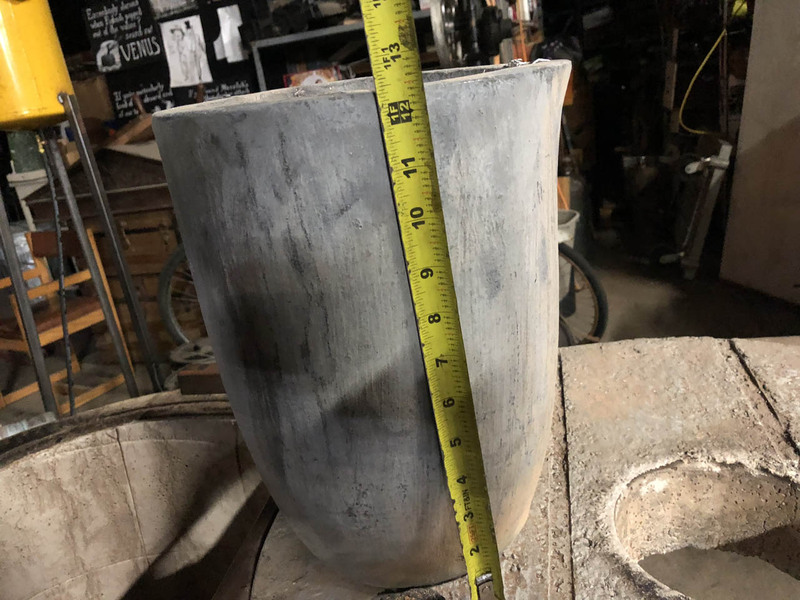 Here is one of the two A40 clay-graphite crucibles I ordered for this, which fit inside, with plenty of room to go larger (also got a size 50 in Silicon Carbide). About 12-1/2 inches high (31.8cm). You can see the yellow fuel tank with the ball valve in the background with the legs welded on. It had 50%WMO mixed with 50% diesel when we were test firing. The lid of the furnace is swung out here with the crucible sitting on it. 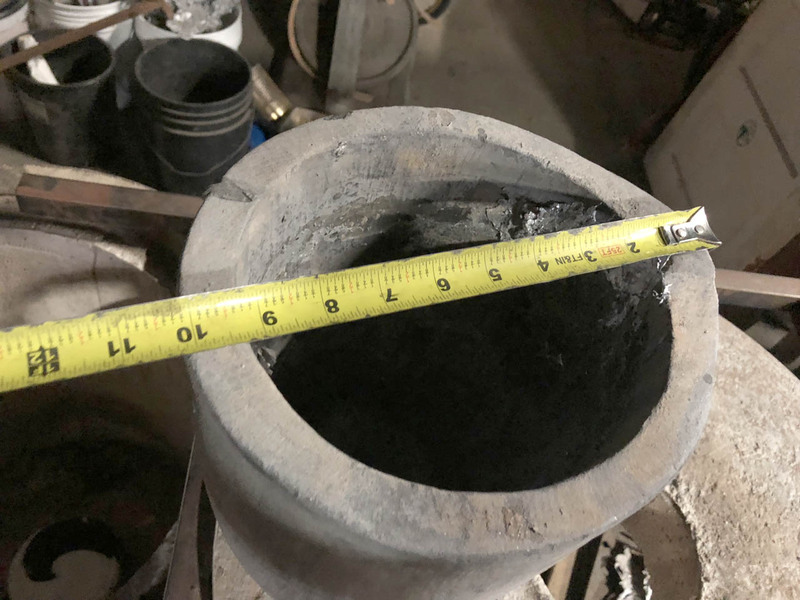 The lid gets hot enough and has plenty of area to set metal pieces to pre-heat them and drive off any moisture before putting into the crucible. I got this 3-phase blower off ebay (apparently from dougdeals.com, whatever that was) at one point. 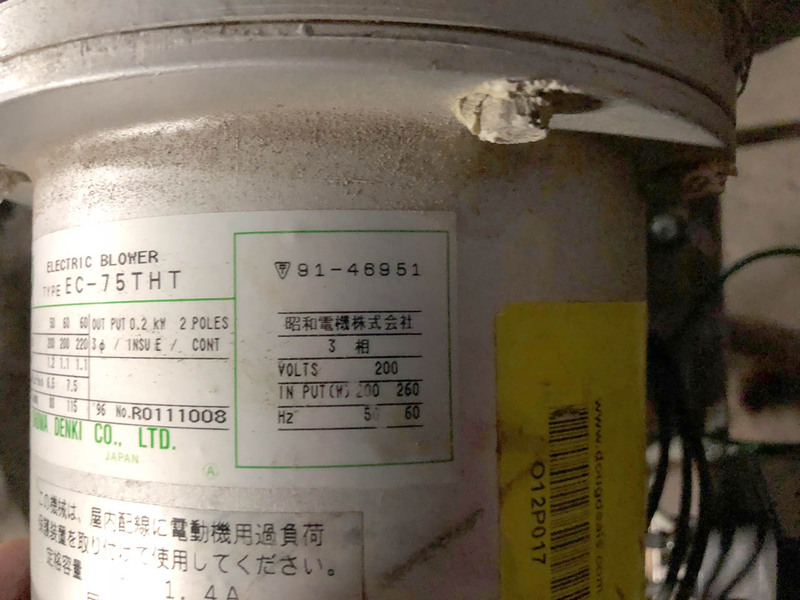 The only takeaways from this part of the label is the part number, the name of the Japanese corporation (in Japanese), 3-phase ("phase" being in Japanese), and the fact that it's rated for 200 volts. Driving it at 50 Hz will consume 200 Watts while driving it at 60 Hz will consume 260 Watts. I'm driving it with a 110/120 volt single phase input VFD that outputs 220/240 volts, three phase, rated at 1HP, or 746 Watts, so it should be well within the power capabilities of the VFD. Since the output of fans/blowers in general varies with the CUBE of the speed, we see quite a significant increase in wattage going from 50 to 60 Hz. In testing, we really never got above 20-25 Hz, because it was a friggin wind tunnel. Not connected up to the furnace, at 60 Hz, a strong breeze (blowing sheets of paper on the floor) could be detected probably 25 feet away. The bottom label, when translated, just talks about heat and not burning yourself by touching it. I used the realtime camera-input feature with the Google translate app on my phone (pretty nifty if you've never used it) and realized that this contained no technical data that was super worthwhile (ok- 1.4 Amps- big deal), so you can pretty much ignore this bottom label. This label has the money shot on it. It tells you the motor has 2 poles, which means 3600 RPM, nominal with 60Hz input. More importantly, it has the CFM and Pressure. Except that the jerks have it in metric units (like the rest of the world uses), so we will have to convert. Max Volume in cubic Meters/minute is 7.5 at 60 Hz. translates into 265 CFM. Max pressure looks to be 115 mm of water, or 0.16psi or 4.5 inches of water static pressure. NOW!!! threre are a few things about these two numbers- they are analogous to (in either PV solar panels or MIG arc welders) max short circuit current and max open circuit voltage. This means, that you won't see both of these numbers at the same time. They are maximum amounts that the blower is capable of achieving. The max flow rate is going to be with no restrictions and the max pressure is going to be into a dead-head blocked-off load. These are two conditions that you can't see simultaneously, so it shouldn't be construed as such- rather just two maximum numbers that the blower is rated to hit under those two very different scenarios. SECOND, fan theory states that outputs are a function of the CUBE of the speed. This is why we see such a difference in going from 50Hz to 60Hz. Going from 50 to 60Hz is a 20% increase in speed ((60-50)/50). We see a 15% increase((7.5-6.5)/6.5) in max CFM and a 44% increase ((115-80)/80) in max static pressure. I would actually expect to see more of an increase, but it's possible that the unit was designed for 50Hz operation and can be overdriven to 60Hz, and that because of this, other unknown losses are kicking in to lower the output increase that we woudl expect. I hope that helps quantify some of the current design parameters of the furnace. As an insurance policy, I have ordered a bunch of Delavan oil atomizing nozzles from the Internets along with three Suntec A2RA-7710 waste oil pumps and am working on ordering 3 motors and couplers to drive them. Why three? Well, they are rated at 2.5 Gallons Per Hour, and I want a combined capacity of UP TO 7.5 gallons of fuel per hour. I may not need that much, but by cycling motor/pump units out, and verying the bypass circuit with a needle valve, I should be able to fine tune the delivery of fuel without needing an elevated tank and without needing to pressurize it. EDIT 18 April 2018: At the KSW shop last Saturday, we talked about the two possibilities of how to set this up with the multiple fuel pumps. We could conceivably use a manifold and check valves and then turn one, two, or all three pumps on to vary the fuel delivery rate and hope that the nozzle selected woudl have a good enough turn down ratio to accomodate the range in GPH of oil. From what I read on Delavan's website, as you approach the design/max GPH rating for a patricular nozzle, the atomization gets ideal and the droplets are the smallest. If you underfeed them, the droplets get bigger. Not ideal. This one tidbit is making me lean toward running a dedicated line from each pump (and I will probably add a fourth for a total of 10 Gallons Per Hour because the volume ratio suggests it might scale to that level) to their own 2.5 GPH nozzle. Then, I can cycle the motors in and out for 2.5, 5.0, 7.5, and ultimately 10 GPH (if it needs it for doing cast iron- aluminum probably won't need that kind of heat). I'm THINKING I can put a needle valve on one of the pumps several outputs and use it as a bleeder bypass back into the fuel tank if I want LESS than the maximum 2.5 GPH that each pump is capable of, though the atomization would potentially slightly suffer, as just mentioned. So now I need to order a bunch of 2.5 nozzles and can experiment with cone style and angle as the only variables. I'll get some pics of the pumps, motors, and couplers next time I'm at the shop. fuel burn rate (10-12 literns/hour) ?